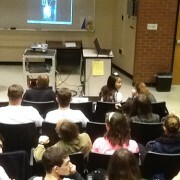 Government and AP Psych students listen to a guest speaker on foreign policy. Raf Bentaleb, a guest speaker, engages students in a discussion regarding foreign policy in the Middle East and North Africa. Students who take government classes and AP Psychology attended. 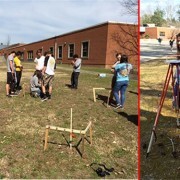 https://wjccschools.org/lhs/wp-content/uploads/sites/20/2016/03/Consoli.jpg 375 665 Amy Wallisch https://wjccschools.org/lhs/wp-content/uploads/sites/20/2017/10/Lafayette-High-School.png Amy Wallisch2016-03-31 11:09:312016-03-31 11:09:31Government and AP Psych students listen to a guest speaker on foreign policy. Seniors – today is the last day to pre-order your Senior shirts. They will not be available for purchase after Spring Break so preorder your shirt for $15.00 today. A sample shirt will be on display at the ordering table. LHS is opening up the prom season with Bowties and Diamonds. You won’t want to miss this prom, there will be extravagance, prizes, a fog machine, fountains, lots of food and great music. Come one come all on Saturday, May 7th to Trinkle Hall at William and Mary. Tickets are $25 each and will go on sale after spring break. The Bayport student run credit union is now collecting change; pennies, nickels, dimes, and quarters for different charity events that will be held every week, this week it’s the Humane Society. These events are open to teachers and students so come on down to the Bayport desk to drop off your change for a good cause. Lafayette is offering a new course called Opportunities in Hospitality & Tourism. You will explore the travel and tourism industry and learn about careers in those fields. Sign up in StudentVue course request under career and Tech, Opportunities in Hospitality & Tourism or see Mrs. Napier in room 118 for more details. Do you want to be a Lafayette cheerleader? Come out to our open gym and skill building clinic. There will be an informational meeting today at 4pm in the Upper Commons. If you have any questions please see Coach Channing in the café. Seniors – as graduation approaches, it is time to think about the words of wisdom you would like to share with your classmates, families and friends. If you are interested in speaking at this years’ graduation ceremony, please visit the LHS Home page for the link to the application or stop by Mrs. Newcomb’s office to pick one up. All applications are due by 2:20pm on Thursday, March 31st. We look forward to hearing your ideas. Senior shirts will be on sale during lunches through tomorrow. They will not be available for purchase after Spring Break so preorder your shirt for $15.00. A sample shirt will be on display at the ordering table. Join the History on Film Club for popcorn & drinks today at 2:30 in the Lecture Hall for “Sometimes in April”. A dramatic retelling of a Hutu soldier trying to get his family to safety during the Rwandan genocide, while years later his brother stands trial for his actions. Senior cap and Gown pictures are taking place today outside the main office between 8am-2pm. There is a $25 sitting fee and walk-ins are accepted. Do you want to be a Lafayette cheerleader? Come out to our open gym and skill building clinic. There will be an informational meeting on Wednesday, March 30th at 4pm in the Upper Commons. If you have any questions please see Coach Channing in the café. Senior shirts will be on sale during lunches through Thursday, March 31st. They will not be available for purchase after Spring Break so preorder your shirt for $15.00. A sample shirt will be on display at the ordering table. There are only 56 copies of the yearbook left. Once they’re gone, they’re gone. No more books will be printed. The library will be closing at 2:30 today. They will resume their regular schedule on Tuesday. Senior Cap and Gown retake photos will take place on Tuesday, March 29th outside the front office. Sign up for a time on the yearbook bulletin board outside the media center. A $25.00 sitting fee is due at the time of your photo. Are you interested in joining the Lafayette Choir next year? Auditions are currently being held for the 2016-17 Advanced and Honors Choirs. See Mr. Rapach in room 625 for more information. Mr. Aadahl’s Architectural Design students practice surveying for a building location. There are only 68 copies of the yearbook left. Once they’re gone, they’re gone. No more books will be printed. The Bayport student run credit union is now collecting change; pennies, nickels, dimes, and quarters for different charity events that will be held every week, this week it’s St. Jude’s. These events are open to teachers and students so come on down to the Bayport desk to drop off your change for a good cause. Register for the Afro-Academic, Cultural, Technological, and Scientific Olympics! https://wjccschools.org/lhs/wp-content/uploads/sites/20/2017/10/Lafayette-High-School.png 0 0 Amy Wallisch https://wjccschools.org/lhs/wp-content/uploads/sites/20/2017/10/Lafayette-High-School.png Amy Wallisch2016-03-24 09:53:462016-06-14 07:52:18Register for the Afro-Academic, Cultural, Technological, and Scientific Olympics! Senior shirts will be on sale during lunches starting today and running through Thursday, March 31st. They will not be available for purchase after Spring Break so preorder your shirt for $15.00. A sample shirt will be on display at the ordering table. Join the History on Film Club for popcorn & drinks on Tuesday, March 29th at 2:30 in the Lecture Hall for “Sometimes in April”. A dramatic retelling of a Hutu soldier trying to get his family to safety during the Rwandan genocide, while years later his brother stands trial for his actions. Attention students – there are only 75 copies of the yearbook left. Once they’re gone, they’re gone. No more books will be printed. 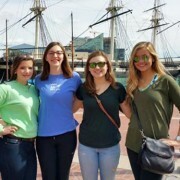 Recently several Key Club Officers attended the District Leadership Conference in Baltimore, MD. Pictured from left to right are Lafayette students Joi Stanley, Megan Roberts, Jamestown High School’s Savannah Lodwick, and Lafayette’s Devin Lucas.